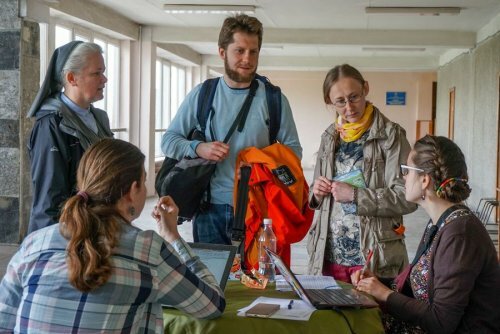 From April 27 to May 1, for the first time in Ukraine, a regional Taizé meeting was held in Lviv, in the capital city of the Galician region, Western Ukraine. For many young people, especially those from Ukraine, this sign of unity was quite remarkable. It’s very important for Ukraine that several Churches took part together in the meeting. We need that unity in Ukraine, especially the unity around Christ and what He thought. The City Council and the Regional State Administration have in many different ways supported the preparation of the meeting. A few weeks before the meeting, billboards throughout the city announced the coming of the young pilgrims and during the gathering itself a big banner was put in front of the City Hall. I am very glad to welcome young people from all over the world at this great prayer meeting in Lviv. Perhaps it is the will of the Almighty that you have come to our city in the year when we received the status of the Youth Capital of Ukraine. It is a great honour for us to be a part of a global religious community. I am convinced that there are a lot of people among you who will become our good friends. 2000 young people took part in the meeting, either coming from abroad – among the represented countries were Poland, France, Germany, Belarus, Russia, Czech Republic, Lithuania, as well as from other Ukrainian cities, or from Lviv itself. All the young people coming from outside were received in host families – and this hospitality in the homes of the Lvivites became a highlight of the meeting. With two other friends, we were welcomed by three women from three different generations. In the flat, made of two rooms, we were six people living for a few days. It has been a totally new experience for me because their house is smaller than my room. Our host family gave us the best they had – it was so kind and touching. It was my first time in Ukraine. I had no idea of what will expect me here. I was really impressed about the hospitality of the people. I will miss all those nice people that I’ve met here! 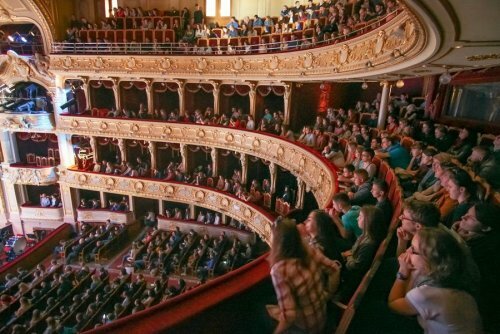 On Saturday morning we had the opening session of the meeting in the Lviv National Opera. Never before had a Taizé event been held in an opera, for me it was also the first time in such a style of building. Within these beautiful walls, Taizé, its volunteers and pilgrims were welcomed by the city of Lviv by several speeches and performances. 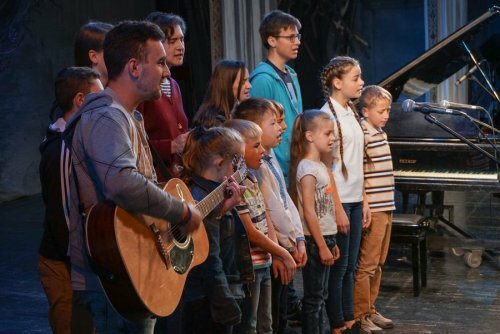 The most touching of these, the coming together in song of the Ukrainian children affected by the war, reminding us why we are here and the importance of these pilgrimages. For the first time in a Taizé meeting, the proposal was made to have the morning prayer together with the host families. It was like a subtle reminder of the time – not so long ago – when faith here was only able to be shared in secret, in houses, by the hidden but persevering practice of a few people. It was also very important to take part in the life of the local Christian communities. On Saturday evening and on Sunday morning, the young pilgrims were invited to take part in the Vespers and in the Liturgy with their host families or in three Cathedrals of several confessions. 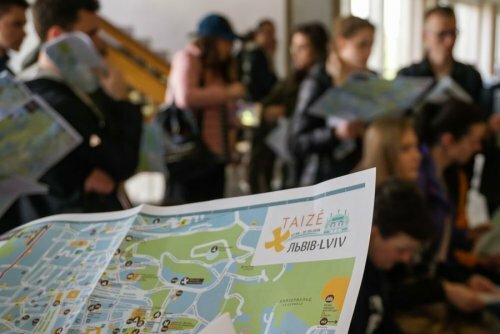 The prayers with songs from Taizé were held in the “SKA Velotrek”, with a beautiful decoration made of a painting of the Lviv landscape, some traditional Ukrainian broderies, trees with Easter eggs and icons. On Saturday midday, the icon of the Mother of God of Zarvanitsa was specially brought from Ternopil by the Greek-Catholic Youth Commission. And on Sunday evening, another icon was brought from the Latin Cathedral. This Sunday evening prayer was quite special, due to an electric incident at the very end of the prayer. Right above the brothers’ podium, a plug started to burn. The fire-fighters and volunteers reacted quickly and the hall was peacefully evacuated. Some young people brought the cross outside, on the field and the prayer continued for long time on the field. A very touching and unexpected moment. On Saturday, Sunday and Monday afternoons, almost 60 workshops in total were offered to the participants grouped according to several fields. Maidan: when faith speaks in one language. Jewish Community in Lviv: the past and the present. Meeting with a rabbi. Depression and Faith: is depression possible for Christians? Youth and Volunteering: presentation of Building Ukraine Together and GOEast projects. Media Literacy: How Not to Become Victims of Fake News? During the three afternoon workshops, a church of the city centre was also kept as a place of silence, with also the possibility of a spiritual talk. More than 300 young volunteers from Lviv started to prepare the meeting from February onwards. They were splitted in nine teams and each team had a concrete mission to fulfill. One of these teams was in charge of the meal times. A beautiful park of the city centre, named after the famous writer Ivan Franko, was the place of the meal distribution. Under a fine Spring summer, all the participants could enjoy some traditional Ukrainian dishes. The host families received their young people for the Friday evening supper and the Sunday lunch. 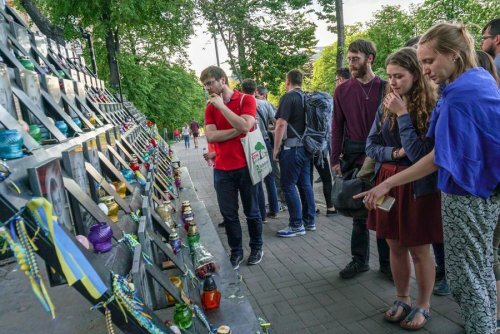 One of the most powerful experiences I’ve had during the meeting was simply talking to a group of young Ukrainians on the walk from the midday prayer to the Park Ivan Franko for lunch. Despite the sometimes humble conditions in the country, it was truly inspiring to hear the hope and intention of the younger generation to actively change their country for the better. Tomorrow, with 20 young people from several countries, we will go to the East of Ukraine to pray for peace. We will also have an evening prayer in Kiev, on Thursday evening. This small pilgrimage will be a way for us to share with others what we have experienced these days in Lviv: hope and friendship in Christ. On our first stop in Ternopil, after 3 hours of driving, we had the chance to enjoy the good weather and the beautiful lake. Afterwards, we visited the Greek Catholic Liturgy in the Cathedral, followed by a beautiful Taizé prayer prepared by local church members. After a common dinner, we started our long trip through the night to Zaporizhia. We had time to sleep, to discuss our impressions of the Regional Taizé meeting in Lviv, to get to know each other better and to have fun playing games during the next 16 hours in the bus. Arriving in Zaporizhia, we were welcomed very warmly in the Roman Catholic Sanctuary of God the Father. The common lunch was followed by a visit to a provisional city of refugees – internally displaced people because of the war in Donbass. It was a very impressive meeting. We learned a lot about the situation of the refugees and admired their strong faith despite these difficult circumstances they have to live through. They did not lose their hope for peace and we were happy to pray with them together. We will keep them also in our personal prayers, when we arrive back home. Following this meeting we attended the celebration of the mass, followed by a Taizé prayer for peace in Ukraine. We were amazed by the number of people from different denominations celebrating his prayer together. For the night, we were welcomed by host families and experienced the great hospitality of our hosts. The next morning, we departed to Kyiv. There we had time to visit the Maidan Square and the memorial of the Heavenly Hundreds. The Ukrainians of our group told us about the ongoing of this recent revolution and on the spot we prayed together for the mercy of God for the victims and their families. The evening prayer was held in the Greek-Catholic Chapel of St Mikhailo, near Arsenalna. It was a special atmosphere to pray for the last time together as a group, but also together with many people we knew from the regional Taizé meeting in Lviv and so many others. We prayed for all the people we had met in this pilgrimage of trust, especially for the refugees of the war and for peace in this country that touched our hearts in the previous days. After another night in host families, we had to say goodbye to each other and to depart to our different home, with the hope to see each other again some day in Taizé.